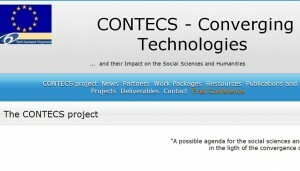 CONTECs, an FP6 project which ran from 2006 to 2008, addressed the potential roles that the social sciences and humanities could play with regard to the phenomenon of technological convergence between Nano-, Bio-, Information technologies, Cognitive sciences and Social sciences and Humanities, its shaping and ethical and societal implications. The project explored major ethical and societal questions raised by technological development in the field of converging technologies and the ways in which these could be addressed by the Social Sciences and Humanities. In the context of imminent transformations to a European knowledge-based society, these questions were at the time seen to present key opportunities and challenges, which the research community should be prepared to face. This activity built on a review and monitoring of technological developments in the converging technologies and relevant global research policy trends, and analysis of their possible implications for contributions by the social sciences and humanities. Nanotechnology was not the main focus of this project, but it was implicitly included in the analysis of related ethical and societal questions. Visit the CONTECS website (external link, accessed 27 March 2014).